Hey everyone! A year or so ago I was really into the glue-on french manicure nails. They always looked so nice, but lately I'm getting much more enjoyment out of my nail polish collection. I look forward to choosing a new color, and even experimenting with different (easy) nail designs. This look is pretty simple though... just a couple of coats of a great nail color. 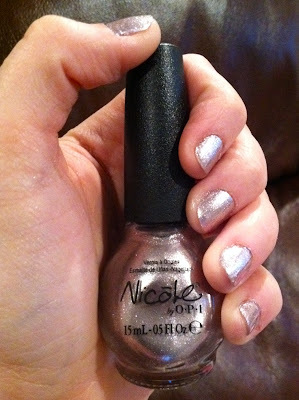 The shade is called "Miss Independent" from Nicole by OPI. I found it at Target for a few dollars. Not sure if you can tell by the picture, but it's a metallic silver with the slightest hint of lavender. I notice the soft purple tone quite a bit in person... and it's a shade unlike anything in my collection- nor is it like anything else I've seen in stores. 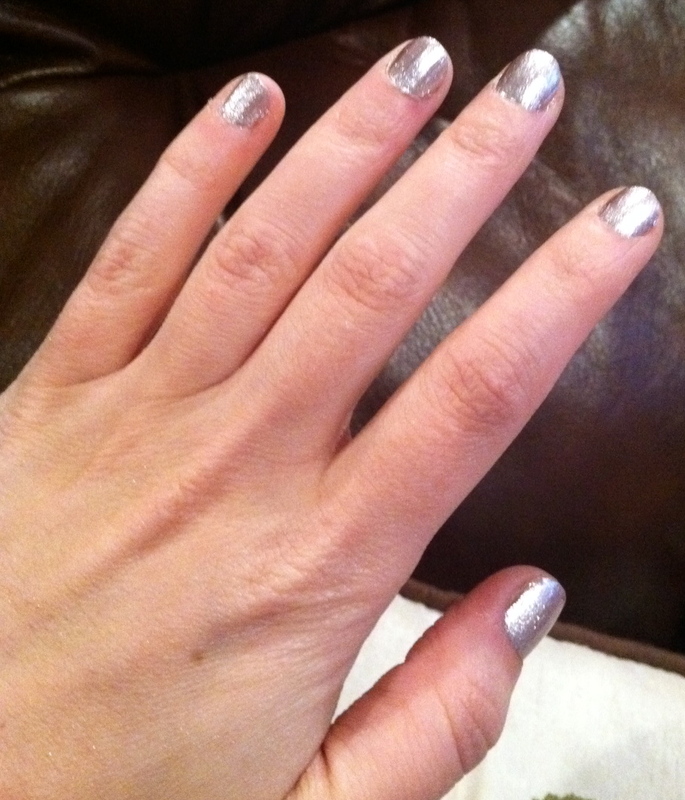 The shimmer in this polish is so fine, and it doesn't have a gritty texture on the nails at all. Two coats gave me even, opaque color. I topped it off with my Milani Glosse Top Coat. I just painted my nails with this color on Sunday, and we're almost to Wednesday with no chips. Again- as it catches the light, the silver tone is really prominent, but otherwise this nail color has the prettiest icy lavender tone. Love it! Please let me know if you enjoy the nail-related posts... it's something I hadn't really done much until recently. This month we're doing a morning show segment called "Wild Wednesday"... so in preparation for that, I got to meet some camels, goats, peacocks, and more! I just posted an album on my Facebook page. I need to shoot some more Cupcake cam at some point. No sign of the grey & white cat mentioned in my last Daily Nuggets, but I'll keep you posted. I am in love right now with glittery/sparkly/metalic nail polishes, and i really like the one you are showing in this post! Wow that is so glitzy! I'm currently trying to extend my nail polish collection and my go-to for that is ELF cosmetics! At £1.50 for a bottle of nail polish it's probably the best way to build up my collection. Reviews of ELF Cosmetic items on my blog! Love nail posts! More please! I love the nail posts! I recently grew mine out after many year of biting. Bad I know. :) Please do keep us posted on the gray and white kitty. I have two gray and whites myself. Hopefully it made its way to its home. i just got copper penny and golden charm by revlon. They are very metallic an I like it! I like the nail polish posts. Love the color so pretty. I'm in love with Zoya nail polishes right now. They have over 300 different colors and they are all so beautiful. They are always running great deals like buy two get two free or free shipping. You definitely have to check them out. Hi Emily, just wanted to say that I am enjoying your daily updates very much! Following your chanel/site for a while now and I really love your way of telling about products. Thank you so much! I love your daily blogs in november and also the nail-posts. French nails are nice, but a little bit boring I think, so I love choosing a color from my nail-polish-collections. I´ve lot´s from the ELF-polishs. I looove when you do nail related posts. I'm glad you are doing this non-stop November because you are making more nail posts this way. I have a nail blog myself. I will leave you the link if you wanna check it out. Keep posting about nails! One, I love this polish, I have it and now I want to use it again! Two, please more nail polish posts, I love seeing the color on before I decide to buy it. Three, I'm loving non-stop November. You're posts have been great. Thanks so much! I used to be into going to the nail shop and getting the acrylic nails but now that I'm back to my own nails I find it way more fun to pick out polishes and change my color as often as I want. I like this color, I may have to check it out. I think this kind of finish is called 'foil'. This color of nail paint is so pretty. I love glittery shades. I simply like it. Yes. love the nail posts. And the color is so pretty!!! Can't see the purple in it but probably in person/in the stores. THanks for sharing love. Yes. Love the nail posts. this color is so pretty - cant see the purple here but probably in person/in the store. Thanks for sharing love. I love the nail color...I said in the past you have lead me away from the acrylic nails...now..I polish my own , pleas! Keep up the videos on nail care/polish , I am one subscriber that joined for that reason . This one caught my eye immediately! I'm def putting it on my list for the next shopping trip to Target! I love this shade! Seems great for all seasons! Also, I do enjoy seeing swatches and photos of nail polishes because that really helps me see the color, so keep the polish posts coming!